As we work our way through the Olivet Discourse, we are in Application section. Jesus has talked about the people who need to watch for his return. The people living before the tribulation must be ready for his imminent return in the rapture. People living during the tribulation must be prepared for his triumphal return to earth. These are the two people groups who are most effected by his return. Jesus now turns to talk about two judgments that will occur at the end of the age. The first takes place in heaven and is for all believers of the church age. It is called the Bema, or the judgment seat of Christ. We learn about it in Matthew 25:14-30. The Bema takes place in heaven right after the rapture. It is for church age Christians. It is a time when Christ will hand out rewards and responsibilities for use in His Kingdom. It is a very important event and is talked about all over in Scripture. All Christians must appear before the judgment seat of Christ, and it is there we will answer for what we have done in the body, whether good or bad. As we look at this parable of Jesus, remember that eternal life is given freely to all who believe in Jesus Christ for it, but rewards are given as wages or payment to those who faithful serve Christ during their life. We get a glimpse into what will happen at the Bema in Matthew 25:14-30. Matthew 25:14. For the kingdom of heaven is like a man traveling to a far country, who called his own servants and delivered his goods to them. And we do know that Christ has gone to heaven, and has been gone now for 2000 years. He has been gone for a long time. Yet He will return to see what His own servants have done with the goods he left them. We see what He gave to His servants in Matthew 25:15. Matthew 25:15. And to one he gave five talents, to another two, and to another one, to each according to his own ability; and immediately he went on a journey. A talent is not a type of coin, but is a weight, it is a unit of measurement. A talent weights 93 pounds, 12 ounces. We could probably just round it up to about 100 pounds. So it is very difficult to know how much money the man is giving to his servants. The amount would vary widely depending on whether these servants were given silver or gold. The most widely used currency of the day was silver, so we will use that to help us calculate the value of what the servants received. The average wage for one day of work was one silver denarius, and a talent consisted of 6000 denarii. In other words, one talent equaled over sixteen years of work. How much money are you making in a year? The Bureau of Labor Statistics reported in 2002 that the average annual wages for all United States workers is about $37,000. This does not include benefits such as health care and retirement, which, considering the cost of health care today, could easily add another $10,000 on to that figure, making it $47,000. Taking that $47,000 and multiplying it by sixteen years, we discover that a talent of money in today’s economy is about $750,000. The first servant received five talents. That would be about $3.8 million. The second servant received two talents making his total $1.5 million. The third servant received only one talent. And by only, I mean only $750,000. This is no small sum of money. This is a huge responsibility. What would you do if you were this third servant, and were told to responsibly manage $750,000? You say, “God will never give me that much, so I don’t have to worry about it.” That may be true. But you do have a hundred dollars, or a thousand dollars, or maybe even a hundred thousand dollars, especially when you factor in your house and your land. These things do not belong to you, but were given to you by God for you to manage responsibly. You are His steward. How are you using the things He has given to you? Where is your money going? How are you investing it to accomplish the greatest spiritual good for the greatest number of people? How are you investing in the Kingdom of God? Kelly Mee was telling me of a church where the pastor was preaching on this passage of Scripture, and several weeks before the sermon, the church did a reverse offering. Rather than collect money, they put stacks of ten dollar bills in the offering plates, and told the people that as the plate was passed, to take out one ten dollar bill each. They weren’t told what to do with it or why the church was doing this. But then, several weeks later, the pastor got up to preach his sermon on the parable of the talents, and he began by reminding the people of the ten dollar bill they had received. To introduce his sermon, he invited people to stand up and tell everybody else what they had done with their ten dollars. Some still had it in their purse or billfold. Some had used it to buy groceries. Some had given it away to someone else in need. One man had bought some stock in a certain company and in just a few weeks, that stock had quadrupled, and he had given the $40 back to the church. After several minutes of such sharing, the pastor went on to preach his sermon. But his point had already been made. All of us have been given money and possessions and position that God wants us to use while we wait for the return of our Lord Jesus Christ. How are you using your time to invest and multiply these things? Not for your own selfish gain, but multiply them for the kingdom of God? Now, although I’ve been talking about physical possessions and riches, this is a parable. And because Christ employs the picture of a huge amount of money, I think that He is talking about much more than just physical possessions. There is much more in view here than just your bottom line. This is a parable, and the elements of parables most often have spiritual counterparts. The spiritual counterpart to the talents is that every Christian is unbelievably rich. We are all spiritual billionaires. When we believe in Jesus for eternal life, we hit the spiritual jackpot. Numerous passages in the Bible reveal this, but none better than the first three chapters of Ephesians. 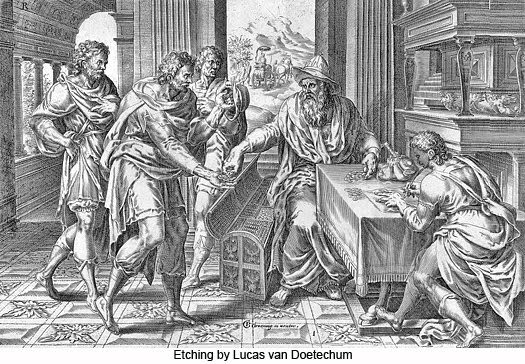 Paul devotes three full chapters to revealing how rich and wealthy we are as Christians. Just read those chapters for yourself sometime, and take note of all the things we have been given in Christ. All things blessings Paul unfolds. All the riches he explains. As Christians, we are rich beyond our wildest imagination. Christ’s picture of talents is not far fetched. If anything it is a vast understatement. We have so much in Christ, we cannot even begin to fathom it. One of the things Paul mentions, though not until Ephesians 4, is our spiritual gifts. These are also mentioned in 1 Timothy 4, Romans 12 and 1 Corinthians 12. But these are especially significant in understanding this parable, because Ephesians 4 reveals that it is when Christ rose from the dead and returned to heaven that these spiritual gifts were distributed. This is what we see at the end of verse 2. It is as this man went on a journey that he distributed these talents to his servants. What are your talents? What are your riches and gifts and abilities? Do you even know? If you do not know what they are, that is your first responsibility. How can you use them if you don’t know what they are? And if you do know what gifts you have been given, how are you using them to further God’s kingdom? We see in verses 16-18 how these three servants used the talents they had been given. Matthew 25:16-18. Then he who had received the five talents went and traded with them, and made another five talents. And likewise he who had received two gained two more also. But he who had received one went and dug in the ground, and hid his lord’s money. The first servant, who had been given five talents, trades with them, and doubles it to ten talents. The second servant also doubled his money, though we are not told how. The third servant, however, the servant with the least amount of money, buries it in the ground. It seems to me, by the way, that Matthew 24:14-18 reveals that all Christians are not blessed equally. Spiritually, we are all equal in Christ. This is the truth of Romans 10:12 and Galatians 3:28. Christ also tells the parable of the workers in the vineyard in Matthew 20 which reveals the same truth. Though we are all equal spiritually, we are not all given the same opportunities and responsibilities on this planet. It may be similar with our spiritual gifts. Some have four or five gifts; others just one or two. Further support for this is that Matthew 25:15 says that these talents were given according to ability. But wherever we are in life, and whatever we are given, we have no excuse to be unprofitable. No matter what our opportunities we have, we are called to be responsible with them. The other thing is that it is very difficult to know who is a five talent servant, and who is a one talent servant. We can probably all agree that someone like Billy Graham is a five talent servant. But there was once a Christian man by the name of Edward Kimball. He was a lowly shoe salesman. He didn’t have any education to speak of. He wasn’t famous or rich. But he did have a friendship with a young man, and Kimball eventually led that young man to Christ. The young man was D.L. Moody, who became a great evangelist and whose work is still having effects today through Moody Bible Institute, Moody Broadcasting, Moody Publishing, Moody Memorial Church, Moody Missionary Aviation and so on. But the story doesn’t stop there. During Moody’s life, his preaching ministry took him to England. At first, he was not warmly received by all the pastors. One of the pastors, the Reverend F. B. Meyer, resisted the unschooled and blunt American evangelist. However, Moody’s influence on Meyer’s parishioners inspired a change of heart in Meyer. Thus, Meyer joined Moody’s evangelistic meetings with wholehearted enthusiasm. Kimball’s influence continued through Meyer when Meyer received an invitation from Moody to come to the United States. While in the states, Meyer’s Bible teaching ministry reached a struggling young preacher named J. Wilber Chapman, whose approach was so transformed that he, too, went into evangelistic ministry. It was Chapman’s own crusade advance man, a former clerk in the YMCA, who was to carry on Kimball’s chain of multiplication. His name was Billy Sunday. Sunday preached across North America with spectacular results. His crusades in Charlotte, North Carolina, produced some converts who organized a prayer group that met for years, praying that God would continue the ministry of evangelism through the people of Charlotte. This group of praying men was led by the Holy Spirit to plan a city-wide crusade. They invited Mordecai Ham, the cowboy evangelist, to speak. During one meeting, some teenagers were among those reached for Christ. They included a young man named Billy Graham. It all began with one lowly shoe salesman. Maybe we would consider him a one talent servant. But in reality, he had the five talent responsibility of teaching Sunday school to some unruly boys, one of whom was D.L. Moody. D.L. Moody’s conversion eventually led to the conversion of Billy Graham, whom all of us consider to be a five talent servant. So nobody can really know how many talents they have been given. And of course, the one who had two multiplied his to four, and maybe if given a little more time, could have multiplied it to eight. I don’t know what talents God has given to you. I don’t know what responsibilities He has assigned to you. But I do know this – they are not insignificant. Even if it is only one talent, that is still $750,000 which can be turned into $1.5 million. When it comes to investing your time and money in the Kingdom of God, there is no limit to what you can do. But we must be about our Master’s business, because the day is coming when He will return. In our parable, that day comes in Matthew 25:19. Matthew 25:19. After a long time the lord of those servants came and settled accounts with them. We do not know exactly how long these servants had to invest their money. Verse 19 says it was a long time. We are not told exactly how long. But this is right in line with the rest of the Olivet Discourse. Chapter 24 especially showed that we do not know when Christ will return, so we must always be ready and watchful. We must always be about the Lord’s work while we have the time and resources to do it. So after a long time, we don’t know how long, the lord returns to settle accounts with them. These talents that they had been given were not gifts. They were loans. The lord expected his servants to take what he had given them and use it to gain more. Maybe part of the problem with inactive Christians today is that although they know of the riches they have been given in Christ, they view them as gifts and not as loans. Maybe our terminology in speaking of spiritual gifts is not the best. Yes, it’s a biblical term, but we must also understand why God gives such gifts. He gives them to us out of love for us, because He knows that if we love Him in return, we will want to give Him something in return. Christmas is almost here, and we are all familiar with the gift giving procedure that goes on this time of year. But those of you with small children, know that frequently, they want to give something to their parents for Christmas. But they don’t have a job. They are not earning any money. So what do you do? You buy a gift for yourself, and give it to the child so that he or she can give it back to you. I’m looking forward to Christmas morning. I am looking forward to opening a gift that I bought for myself. It’s not the gift at all. There is really nothing I want. But simply having Taylor carry over a gift that says, “To Daddy, from Taylor” on it, and watching her face beam because she gets to give me a gift, is going to be one of the most wonderful things. God knows that those of us who love Him, are so grateful for all that he has given to us, that when we get to heaven, we want to be able to give Him something in return. Not that He needs it. He already owns everything. But it an act of love, and love is what God seeks from His children. But we are more responsible than two and three year olds. This is why God does more than just get something for Himself and then give it to us to give to Him. He wants to see how much we love Him by what we do with the things He gives us. If you have an eight or ten year old, maybe you give them ten or twenty dollars and tell them that they are to use that money to buy Christmas gifts for the family. Maybe you provide household chores they can do for payment in order to earn money to buy presents. This is much closer to the point of this parable. God has given us some huge gifts. Why? Because He wants to see what we will do with it. He wants to see how much we love Him. But more than that, He wants to see if we are responsible. If we are responsible in little things, like $750,000 or the vast spiritual riches He has made available to us, then when we get to heaven, He will give us responsibility over even greater things. This is what the parable goes on to explain. The first servant comes before his master in Matthew 25:20. This servant took the five talents, and through is decisions and wise management, turned them into five more. The first reward this servant receives is commendation. Praise for a job well done is one of the best things anyone can hear. Child psychologists tell parents and teacher that most often, words of praise for a job well done are more important for a child to hear than gifts and presents. That is the way it is with us to. I can think of nothing I would rather hear in heaven than the words recorded in Mathew 25:21. That is why I have made it my goal to learn what talents God has given me and use them to my utmost ability for Him. My responsibility, my God-given task on planet earth is to teach the Word of God to others so that they are equipped to do the ministry God has called them to. I am an equipper. That’s my function. I want to know Jesus and make Him known. A lot of this comes from Ephesians 4:11-16 and Matthew 28:19-20, but the two passages that sing the melody of my heart are Acts 20:24 and Colossians 1:25. I am a minister according to the stewardship from God which was given to me for you, to fulfill the Word of God. I don’t want anything else in life to move me from this task, but I want to finish my race, and the ministry which I received from the Lord Jesus, to testify to the gospel of the grace of God. I hope that you have either found your ministry and are fulfilling it, or you are actively seeking and praying that God would reveal it to you. If you do not know what God wants you to do on this earth, what talents and responsibilities He has given to you, it is most important that you find out. Pray, talk to other Christians, read the Bible, attend church as much as possible, listen to sermons. One thing that is most beneficial is experimenting in ministry. 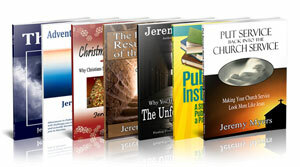 If you don’t know what God wants you to do, try out a few ministries to see how they fit. Get involved and slowly but surely, you will discover what you enjoy and what you don’t. It will become obvious what you are good and what you should stay away from. God has a plan for your life and He wants you to walk in it. You will be miserable until you do. I’ll be honest. There were many years where I did not know what God wanted me to do. I was always sure that God wanted me to be a pastor. But there were several years where I was miserable being a pastor. But recently, I have discovered why I was miserable. Notice further that it is not just the commendation the servant receives. He also receives a promotion. In exchange for his ten talents, this servant gets more responsibility in the kingdom. He gets to take part in ruling the world. Governing the nations. He has proven that he is faithful in some things, and so can be trusted in greater things. Heaven will be a restful place. Christians who die are “entering into their rest.” But for me, when I get to heaven, I don’t want to rest. I don’t want to sit around on a cloud and play a harp. I want to be in charge of God’s library. At the end of John, we read that if everything Christ said and did were recorded in books, not even the whole world could contain them. But I’m thinking heaven could, and I for one, want to find out everything else that Jesus said and did. I think I’ll have an opportunity to do so in heaven. Of course, I probably wouldn’t have to read a book to find out. I could go have a cup of coffee with Jesus and let Him tell me. And then I want to go visit Wendy’s mansion and take her to see the other side of the universe with me. I want to personally see Orion’s Nebula. After that, we’ll go to the Crystal Sea. She wants to swim like a dolphin; maybe God will let her. But you know, along with all of this fun and rest, we read in this passage, and many others, that there will also be work. There will be responsibilities. Many people think that there will not be work in heaven, because work is part of the curse. It isn’t. Work is not evil. God worked, and is even working until this day. And here in Matthew 25:21, we see that God assigns work to his servants to perform in the Kingdom. Don’t think that when you get there, you can sleep for a hundred years. Depending on your faithfulness doing God’s work now, you will be given more and greater work to do in the kingdom. It won’t have the downsides like work here has – that is part of the curse. But in the Kingdom, you will enjoy it. It will be fulfilling and rejuvenating to work in heaven, just as, when you discover what God wants you to do on this earth, it too is fulfilling and rejuvenating. A pastor I once knew worked 80 hours a week, 40 of that just in sermon preparation. I personally think he neglected his family some, and I told him so. But even though I enjoy pastoral ministry, I don’t think I could ever work 80 hours every week. But he said that he enjoys it so much, it’s not work for him. He gets energized and refreshed. And that is true. When you are doing what God wants you to do, it’s not work. It’s more like play. Some people could golf or fish or hunt 80 hours a week. People who are doing God’s work feel like they could do it for 80 hours a week and never get tired or worn out. Christ, as the most faithful and obedient servant of God, will be the most joyful and happy person in the kingdom. This first servant, as a faithful servant, is allowed to share the joy of Jesus Christ. I think that in heaven, there will be some special times of fellowship, some special relationships, some special conversations, which will be reserved for only the most faithful servants. These are the three things this first servant received. A commendation, a promotion, and an invitation to greater joy. We learn about the second servant in verse 22. This second servant did not have as much native ability as the first servant. He did not receive nearly as much talents. But he had taken what he had, and worked as hard as he could. And he doubled what he had. But do you notice what happens? He receives exactly the same reward as the first servant. He receives the same commendation. The same promotion. The same invitation. He doubled his master’s money, and so receives the approval of his Lord, and the added responsibilities in the Kingdom. There is great encouragement and comfort here. You and I may not have the same opportunities that Billy Graham or D.L Moody had. But if you are faithful in what God has given to you, you can be just as rewarded as Billy Graham or D.L. Moody. I agree with Zane Hodges when he says that when we all get to heaven, we may very well see a Christian standing next to Billy Graham whom nobody has ever heard of. Maybe she was a woman. She served as a maid, cleaning up after other people. Vacuuming floors and emptying garbage cans. But she scrimped and saved her way through life so that she could send money to the Lord’s servants in various places and give money to the needy. And maybe she lived alone her whole life. And because she lived alone, she prayed a lot. Maybe she prayed for the Lord’s work all around the world, and wonderful things happened because of the prayers of this women. She didn’t have nearly the opportunities that Billy Graham had, but she was very faithful with what she had. And so when it comes to the judgment seat of Christ, she is standing there, right next to Billy Graham. She will be rewarded and honored to the same extent because she was faithful with what she was given. Maybe one of you will be standing there as well. It doesn’t matter if you are the first or second servant, you still receive all three rewards. But there is still a third servant. None of us want to be this servant. We learn of him in Matthew 25:24. This man was afraid of losing what he had been given, and so he buried it. He hid it in the ground so that when the Lord returned, he could return it. Most often it is not the ones who have lots of abilities and talents who are afraid of using them for the Lord. Most often is the one who thinks he doesn’t have very many abilities and talents that goes and buries them in the ground. We use our supposed lack of resources as an excuse to sit on the sidelines and not do anything at all. Maybe this is because of a fear of failure. I understand this fear of failure. We all fear to step out on a limb and try something great for God. We are afraid we might fail. But you know, two things keep me from allowing the fear of failure to paralyze me. The first is the recognition that I cannot exhaust the riches God has given to me. One of the reason Jesus chose such astronomical figures in this parable is to reveal that we can never use up the riches God has made available to us. Even though this servant might have been able to lose $750,000 in a few bad investments, we can never lose the riches God has given to us. But maybe it wasn’t a failure at all. The Bible says that God works in all things for the good of those who love him and are called according to his purpose. Maybe, when you wanted to use those spiritual resources to evangelize Fortine, God wanted you to learn some humility and so He caused your plan to fail. But there was still a return on your investment because you came out the other end more like Jesus Christ. Do you see how this works? When you try things for God, it is impossible to run out of resources, and it is almost impossible to fail. The only failure is when you fail and don’t learn anything by it. But as long as you keep pressing on, and running hard and fighting the good fight, you do not need to fear being this third servant. You do not need to fear failure. This is a positive reason to serve God with our spiritual talents. The second reason is negative. The second reason we shouldn’t fear failure is because of a greater fear of failing Jesus. My fear of disappointing Jesus is much greater than my fear of failing at something I try for Him. And the only way we disappoint Him is by not trying to do anything with what He has given us. More than the fear of failure, I fear hearing the words of verses 26-27. Christ’s words toward this third servant are completely the opposite to what the first two servants received. First of all, whereas the faithful servants were commended, this one is reproved. Jesus says to this servant that at the bare minimum, he should have deposited his money with the bankers in order to receive interest. Jesus wants you and I just to do something. The only thing He doesn’t want us to with what he has given to us is sit on it. Gaining interest in the bank is one of the slowest ways to gain profit from money. But it is also one of the safest. And Jesus says you can do this. That is fine. Do something safe with what He has given to you. Just don’t sit on the money. If this servant had at least invested it, he would not have heard this stinging rebuke. So if you want to start out slow, how do you invest your spiritual money with the bankers? It’s easy. When you invest your money with a banker, what you are doing is giving them your money, and letting them invest it in other ways. It is kind of like giving them a loan which they then pay you interest on. When you do this, you are not taking a risk in starting a new ministry or leading a ministry. They are taking the risk, and you are just helping out with your time and abilities. They are even taking a risk in letting you on board. So don’t disappoint them. If they give you something small to do, do it to the best of your ability. You may not be the kind of person who can build a whole house. But you can at least pound a nail. You can at least carry off scrap lumber. You can make sandwiches and coffee. These are all investments with the banker. Maybe as you learn to serve in small ways, you will gain some confidence, and will be able to begin a start-up ministry of your own, and others will invest with you. No Christian should have to be the third servant. There are a myriad of little things you can do. Do them, and you will be surprised at how fast the interest accrues. You know, even with one talent, $750,000, gaining an interest of only 1%, this third servant would have been earning $7500 every year! And with his lord being gone for a long time, that adds up! Let’s say that the lord was gone for only ten years. That is not a long time, but in just ten years, at 1% compounded interest, that $750,000 would have turned into $828,000. Even small things add up over time. This servant should have at least been willing to do the little things. But he wasn’t even willing to do that, so in Matthew 25:26-27 he was reproved. Then, in verse 28, rather than being promoted, he is demoted. Even what he has is taken from him. Matthew 25:28-29. So take the talent from him, and give it to him who has ten talents. For to everyone who has, more will be given, and he will have abundance; but from him who does not have, even what he has will be taken away. Here is the summarizing lesson of the parable. If you are faithful in what God has given to you, you will be rewarded. If you are unfaithful with what God has given to you, even what you have will be taken away. The reward is based on faithfulness, not on the size of the responsibility. Even the smallest tasks will receive reward if we are faithful in them. One thing you cannot do is sit on your talents and be lazy and unprofitable. You must use it or lose it. Like Christ, you must be about your Father’s business. This servant will not be allowed to do anything of significance in the Millennial Kingdom. He chose during his life to sit on the sidelines. As result, in the kingdom, he will be forced to sit on the sidelines. I am sure that this servant would give anything to be able to serve with Christ, but his opportunity is gone. He squandered his chances. And so rather than more opportunity to serve, this third servant has received a stinging rebuke. Rather than being commended, he was reproved. Then his talent has been taken from him and given to someone else. Rather than being promoted, he was demoted. Now come one final result of his unfaithfulness in verse 30. Rather than being invited to share a deeper fellowship with Christ, he is refused deeper fellowship and intimacy with Christ. Matthew 25:30. And cast the unprofitable servant into the outer darkness. There will be weeping and gnashing of teeth. I am not surprise that some people think that this verse refers to hell. But that is not what this passage teaches. We must not read hell into it. He does not end up in hell. He does not lose his salvation. He does not prove he was never saved in the first place. There are many who believe that though we are initially saved by grace alone through faith alone in Christ alone, in order to finally get to heaven, we must maintain good works. But entrance into heaven in never based on how well we obey God, but is based solely on how well Christ obeyed God. Christ bought for us what we could never buy for ourselves, and then gave it us free of charge. So this servant does not end up in hell. He is still a servant. He makes into the kingdom, but he loses his right to rule there. He still has a relationship to Christ, but he does not have the deep fellowship that the other servants received. There is another common error among Christians which says that all of us are going to equally rule and reign with the Lord. But the Bible teaches that while some Christians will rule and reign over cities, there will be many Christians who will be subjects in the kingdom. Rather than rule, they will be ruled over. “Consider our nation, the United States of America. I am a subject in this [country] but I have no sovereign power. There are men who have power – there are mayors over cities, police commissioners, United States marshals, governors; there are legislators, both in the Senate and Congress; there are members of various courts and cabinets. There are many, many individuals in the United States who have positions of authority, but I am simply a subject.” I am simply a citizen. This third servant is a subject of the kingdom. He will be a citizen of the kingdom. He will live there and work there, but will not rule there. When given the opportunity to prove himself responsible in small things, he failed, and so is given responsibility over nothing. When he realizes his grave mistake, he is terribly grieved. He had such an amazing opportunity to be used by God and for God. But he was too lazy and too scared. He had riches beyond his wildest imagination that could have been turned into eternal riches. But he squandered these eternal riches by refusing to do anything with his temporal riches. Let me show you this by explaining more carefully what this verse teaches. Let’s talk about the outer darkness and the weeping and gnashing of teeth. The text says that he is cast into outer darkness where there is weeping and gnashing of teeth. This does not refer to hell. People who read hell into Matthew 25:30 run into the problem of explaining how hell can be a place of fire, yet also be a place of darkness. But when we realize that Matthew 25:30 is not talking about hell, we no longer have that problem. Of course, on the other hand, if this refers to heaven, we have a problem with explaining how there can be darkness in heaven. Revelation tells us that there is no darkness in heaven. But we must remember what we are dealing with here. This is a parable. It uses symbolism and metaphors to make its point. The outer darkness is a symbol, not of literal darkness in God’s Kingdom. It represents a sense of loss and regret over not being faithful with his talents. It represents a loss of fellowship with Christ that otherwise could have been had. Remember, the other two servants were invited to share in the joy of their lord. This servant is refused this joy. This metaphor is the opposite of the third reward given to the first two servants. Further meaning about this phrase can be found by seeing how it is used elsewhere. Only Christ uses this term and then only three times in Matthew (8:12; 22:13; 25:30). In Matthew 8:12, is the sons of the kingdom who will be cast outside of a joyful banquet hall. In Matthew 22:13, it is a man who responded to the call of salvation to come to the banquet, and was actually allowed in, and is addressed by God as being a friend, yet he did not have the proper wedding clothing, and so is cast outside of the joyful banquet hall. And of course, here in Matthew 25, it is a servant of the Lord who was not faithful in his responsibilities and so is also cast out of the celebration hall and into the darkness outside. So what is the darkness outside a picture of? As was indicated in the study of Matthew 25:1-13, many of the ancient Near East wedding activities took place at night. The feasting and dancing was often held in a brilliantly lit banquet hall. The surrounding courtyards and gardens, however, were often left in darkness. Those who had improper behavior at the celebration or who were not welcome for one reason or another, were not allowed to take part in the celebration, and were escorted outside into the darkness. That is what the term outer darkness, or “the darkness outside” refers to. It is not hell. It is not missing the kingdom. It is missing the wedding celebration. It is a metaphor describing the exclusion of the carnal Christian from a glorious reign with Christ. He is still in the kingdom, he just does not reign there. He stands on the outside looking in. He sits on the sidelines during the victory lap because he refused to be involved in the game. The phrase weeping and gnashing of teeth is similar. Again, this phrase does not refer to the experience of the unsaved in hell. It is a phrase used to describe extreme and profound regret. It is found seven times in the New Testament and while three of those times does refer to the experience of the unsaved in hell (Mt. 13:42, 50; Lk. 13:28), the other four refer to the regret some believers will experience in the kingdom (Mt. 8:12; 22:13; 24:51; 25:30). The people of the Ancient Near East have always been much more expressive in their grief than we are in Western culture. One scholar writes that “the Hebrews did not restrain themselves from expressing emotion through weeping.” It was even customary to hire professional mourners at a burial. Sometimes special clothing was used. A black garment made of goats hair called sackcloth was worn and then torn form top to bottom signifying intense, emotional grief. Mourning consisted of loud cries, rending the clothes, sprinkling dust and ashes on your head, beating the breast, and gnashing the teeth. Believers who fail to live as Christ wants them to will experience a stinging rebuke, exclusion form the wedding banquet, and millennial disinheritance. Such things will cause tears of regret and remorse in the life of any Christian. I struggle with the parables because of some of the things you mentioned in this post. But I also think what you say about Christians being “excluded from the banquet” and crying “tears of regret and shame,” runs into problems when you read such verses as Revelation 21:4 — “He will wipe every tear from their eyes, and there will be no more death or sorrow or crying or pain. All these things are gone forever.” This is after the old heaven and the old earth had disappeared and the new Jerusalem had come. Are you saying that before the new Jerusalem or the new heaven (as John calls it), Christians who have not used their “talents” wisely will experience the sorrow you mention? I’m not debating or disrespecting your theology. I just love discussing the Word of God and journeying through the tougher parts of it with others. Yes, I think that is how I currently understand the order of events. The Judgment Seat of Christ and the wedding feast of the Lamb would predate the new heavens and new earth, and so at the Judgment Seat and the Wedding Feast, there may be times of mourning and profound regret for a life poorly lived. Having said this, I am rethinking a lot of the theology I used to believe, and this area is one that is in flux. So do your own study and thinking (as it sounds like you already do). This verse does not say it’s a parable, it also doesn’t depend on our faithfulness if we’ll be at the Marriage Supper of the Lamb. Because all who have redeemed shall be there. I don’t see the outer darkness, like you see it. Where are the scriptures that back that up ?